Not in heaven. Not beyond the sea. Every week, Julie Seltzer, artist and Torah scribe, bakes a challah depicting an aspect of the week’s Torah portion. “It is not in heaven” is often quoted to mean that how we do Jewish is up to us, not God, to decide. In the context of the Torah, however, it means that torah is not far away or incomprehensible. The torah is already inside of us. 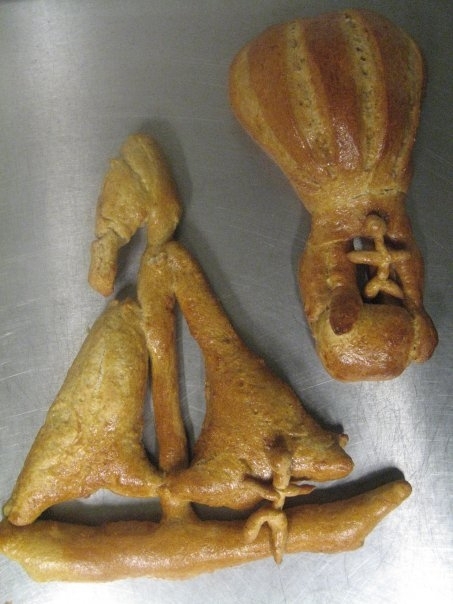 The challah that you see here are: A person in a hot air balloon, and a person in a ship, mistakenly searching in a far-off place for the torah. The people fell on their faces. The prescription for holy psoriasis. Regulations for the Zadokite priests.